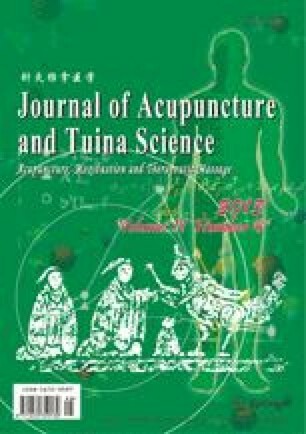 This paper collects and analyzes 40 398 pieces of information from Chinese Modern Acupuncture Information Database (1970–2002). It covers 93 articles concerning the treatment of chronic gastritis by acupuncture and 5 325 subjects, the total effective rate being 94.4%. The frequent treatment methods are needling, moxibustion, burial therapy, and hydropuncture. The major acupoints are Zusanli (ST 36), Zhongwan (CV 12), Weishu (BL 21), Pishu (BL20), Neiguan (PC 6), Ganshu (BL 18), Sanyinjiao (SP 6), etc. In the presence of severe stomachache, Liangqiu (ST 34) and Gongsun (SP 4) are added; in the presence of abdominal fullness, Tianshu (ST 25) and Qihai (CV 6) are added; in the presence of diarrhea, Tianshu (ST 25) and Shangjuxu (ST 37) are added; in the presence of vomiting, Shangwan (CV 13) and Taichong (LR 3) are added.